Seminole County Resident Jimmie “Curtis” Morgan has been appointed by Oklahoma Governor Mary Fallin to serve on the Seminole State College Board of Regents. He will replace Regent Jeff Miller whose term on the Board expires at the end of June, 2013. The appointment was confirmed by the Oklahoma State Senate Education Committee on March 4 and sent to the Oklahoma State Senate for final approval. The nomination was carried by Senator Harry Coates (R-Seminole). Morgan’s seven-year term as a Regent concludes on July 1, 2017. Dr. Jim Utterback, President of Seminole State College, said that Morgan has been a long-time friend and supporter of the college. “Mr. Morgan is an outstanding business leader who understands the economic needs of the community and will bring a great deal of knowledge to the Board. We are honored to have him as a member of the SSC Board of Regents. We commend Governor Fallin on this appointment,” he said. Morgan is C.E.O. 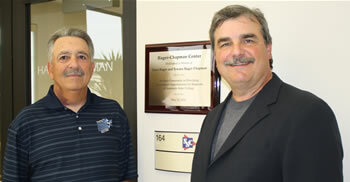 of Tiger Trucks, Inc., of Seminole, and oversees all operations of the family business. He was been with Tiger Trucks since his graduation from Seminole State College in 1981. Morgan has been a part of the Seminole State College Booster Club since 1997 and was appointed to the Executive Board in 2008. He was inducted into the College’s Alumni Hall of Fame in 1998. 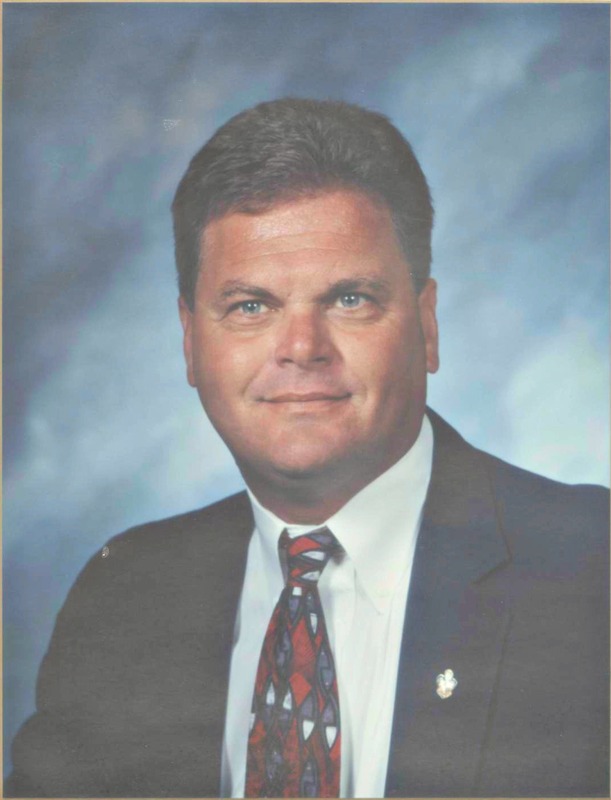 He was honored as the “Oil Man of the Year” by the Oklahoma Oil Museum in 2008, and inducted into the Seminole High School Hall of Fame in 2008. At his Senate confirmation hearing, Morgan said he was appreciative of the confidence placed in him by Governor Fallin and Senator Coates. “Seminole State College is very important to our community and area of the State. I look forward to serving the institution as a Regent,” he said. The seven members of the Seminole State College Board of Regents are appointed by the Governor for seven-year terms. The Regents serve as the College’s governing body and have the supervision and management responsibilities for the College. Other members of the Board, listed by order of appointment include: Jeff Miller of McAlester, David Wilson of Seminole, Marilyn Bradford of Shawnee, Leesa Adams of Shawnee, Mike Ervin of Wewoka, Marci Donaho of Seminole, and Karen James of Seminole. Seminole State College Educational Foundation has announced that U.S. Congressman Dan Boren and his wife Andrea have given a lead gift for the construction of a new center at Seminole State College. The Borens will help fund a facility to house sponsored federal programs and student organizational offices on the SSC campus. Tentative plans are to attach the structure to the Walkingstick Student Services Center. The SSC Educational Foundation, established in 1972, serves as an independent organization established to cultivate donations and financial support for the College. The Foundation provides student scholarships and assistance with a variety of cultural programs and capital projects on campus. During the past decade, the Foundation has experienced substantial financial growth due to the voluntary contributions from alumni, friends, the community, parents, businesses, corporations, government sources and other organizations. It currently has assets totaling over $3 million. Boren was born in Shawnee in 1973. His parents are David and Molly Boren, the late Janna L. Robbins and John Robbins. Boren received his Bachelor of Science degree in Economics from Texas Christian University. He also has received a Master’s of Business Administration from the University of Oklahoma. He studied at Yale University, in New Haven, Conn., and at Oxford University in England. Andrea Boren was born in Aberdeen, South Dakota in 1982. Her parents are Ken and Cindy Heupel. She is a graduate of the University of Oklahoma. Boren served as the Field Representative for U.S. Congressman Wes Watkins, responsible for Seminole, Pottawatomie, Hughes and Pontotoc Counties. He was hired to serve as the President and CEO of the Seminole State College Educational Foundation in 2001, after completing his Master of Business Administration degree in International Business from the University of Oklahoma. “Seminole State College is a tremendous asset to our area and to the entire state. Andrea and I believe that the Educational Foundation has the potential to provide major support for the College’s programs and capital needs as well as assist with student scholarships. This is a great opportunity for us to help build the College and provide a service to central Oklahoma,” Boren said. Boren announced on June 7, 2011 that he would not seek re-election for a 5th Congressional term. In January, he will assume a position as President of Corporate Development with the Chickasaw Nation. While living and working in the Seminole area, Boren has served on numerous boards, including the Seminole Chamber of Commerce, Wewoka Downtown Investment Group, Big Brothers Big Sisters, the Seminole Historical Society and the Jasmine Moran Children’s Museum. He has also been an active member in the Rotary Club International of Seminole and the Last Frontier Council’s Boy Scout Campaign. The Borens reside in Muskogee, Oklahoma, where they are raising their two children: Janna, age 5, and Hunter, age 2. 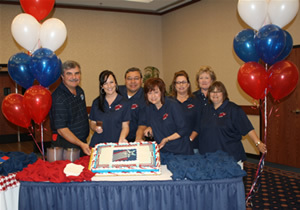 Employees and community board members of Seminole State College celebrated the public kick-off of a “Shaping the Future” Capital Campaign this week. Last Spring, the Seminole State College Educational Foundation asked an outside consulting firm to survey and interview College employees, community leaders and potential financial supporters about their opinions of the college and what plans should be made for the future. According to SSC President Dr. Jim Utterback the response was overwhelmingly positive. “Our plans to endow scholarships, continue our growth and expansion, and enhance academic programs were strongly supported. We are extremely proud of our past. The physical growth of this campus, the development of new academic programs, the dramatic increases we have experienced in enrollment growth, and our recent 10-year accreditation announcement are all tremendous accomplishments. However, we are even more excited than ever about the future,” he said. This winter, the Foundation began a “quiet phase” of the campaign to solicit support from “Friends and Family” before kicking off the public efforts to raise funds. Three long-time College supporters stepped in to lead the “Shaping the Future” Campaign. Kenneth Henderson and Ben Walkingstick agreed to serve as Co-Chairs, and Melvin Moran has agreed to be an Honorary Chair for this effort. Foundation Chairman Mark Schell, Foundation Vice Chair Kenny Pryor, SSC Rural Business and Resources Director Larry Smith, consultant Harrel Kennedy and SSC Vice President for Institutional Advancement Lana Reynolds have been serving as the Steering Committee for the Campaign. The campaign began with an on-campus campaign effort which was led by five employees: Nursing Faculty Member Donna Chambers, Social Sciences Faculty Member Tracy Jacomo, Coordinator of Media Relations Dustie Butner, All-Nations Student Development Center Secretary Tina Jones and Campus Police Chief Dan Factor. A goal was set to get maximum employee participation in the campaign with the hope of raising $30,000. After surpassing that amount, a challenge goal of $60,000 for employees was established. Utterback has announced that the challenge goal was also surpassed and to-date, SSC employee gifts and pledges to the “Shaping the Future” Campaign total over $75,000. He complimented the employees for their dedication to serving students and their interest in the future of the institution. “Their giving helped set the stage – and pre-campaign pledges from our Foundation Board and community friends – now total more than $1.25 million dollars. This campaign is off to a great start,” Utterback said. “The overwhelming support that the campus has shown the campaign is very impressive and I am proud of the SSC supporters and campus family that have embraced such an ambitious goal,” he said. The “Shaping the Future” Campaign will raise money for endowment scholarships; academic program expansion and enhancement; faculty, staff and student support, travel and enrichment programs and future endowment. 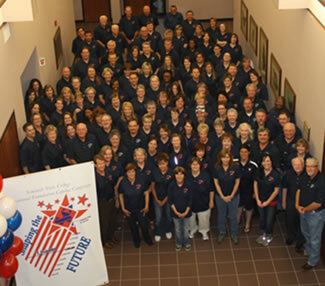 If you are interested in more information about the SSC “Shaping the Future” Campaign please call the President’s Office at (405) 382-9200. It was a time when young women didn’t usually go far from home after high school, but, Tywana Hager left Seminole County in the early 1940s for California to work on an assembly line for Douglas Aircraft. A real-life “Rosie the Riveter” – she was a female worker who helped the war effort when men left home to fight in World War II. That was the beginning of a career that allowed Tywana Hager Chapman to build a life savings that will help others for generations to come. Through a trust established by Mrs. Chapman, the Seminole State College Educational Foundation has been named the benefactor of a $150,000 endowment to assist students – particularly young women – to receive an education. The donation was announced as one of the lead gifts of the College’s “Shaping the Future” Capital Campaign – an effort to raise $2.5 million in private funds for scholarships, academic programs and the physical growth of the institution. Born in 1923 to a family of farmers south of Konawa in the South Canadian river bottom in what is known as “The Bend,” Tywana Hager attended Pilgrim’s Rest Grade School and graduated from Byng High School before moving to Long Beach, Calif. When she married, she left Douglas Aircraft to help her husband build several privately-owned businesses. They began building a financially secure future, but a divorce in 1977 left her basically destitute. She left the marriage with $50 in hand, and returned to Douglas – now owned by Boeing. Her career with the aircraft company spanned 37 years – during which time she advanced through several positions. She became the company liaison between Boeing and outside manufacturers for the development and construction of the C-17 aircraft. A child of the Great Depression, Tywana was always frugal, according to her brother Leon Hager of Seminole. “She didn’t want to spend money on extravagant things for herself. She didn’t have cable television in her home and she drove a 1977 Plymouth. When I would visit her in California, I’d try to get her to buy a car – but, she would say she didn’t need a new car,” Leon said. A good friend and neighbor was a financial investment consultant and guided her through some wise investments and the establishment of the Tywana Hager Chapman Trust. Her brother Leon was placed in charge of overseeing her wishes regarding the Trust following her death in 2006. “She wanted her money to help people. Tywana would be pleased to know that her money might help young women get a good education. She would like the fact that her assistance might make a difference if they ever found themselves in a predicament like she found herself in when her marriage ended and she had nothing,” Leon said. Leon’s ties to Seminole helped bring the Trust money to SSC. He had moved to Seminole from the Konawa area in 1967 to raise his family, but later moved to Oklahoma City and worked at the General Motors plant for 24 years. An avid golfer, he returned to Seminole often to play golf with his buddies at the Jimmie Austin Municipal Golf Course. He said he couldn’t wait to retire so he could move back home – and did so in 2006. Her lifetime of hard work, dedication to family and friends, and a desire to help other people has brought more attention to Tywana than would have been comfortable for her. When the ribbon was cut on new 16,400 square-foot Student Services Center at Seminole State College this week, faculty, students and community supporters were able to tour a conference area dedicated as the “Hager-Chapman Center” inside the new facility. Her influence – like her ashes – have returned home.